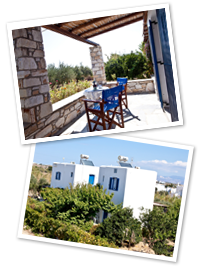 Flora & Agelos Studios & Apartments offers charming, clean and cute accommodation on Paros Island, Greece, in a very peaceful location just a short walk from the the sea. The two-storey Cycladic building includes 6 studios and apartments, all with fully-equipped kitchenettes, bathroom, TV, air-conditioning, WiFi and private balconies. The rooms are set in a very tranquil location overlooking olive groves and the bright-blue Aegean Sea and are surrounded by well-tended gardens that include colorful flowers, grape arbors and fruit trees…and are still just a pleasant short stroll to beautiful beaches, like Boudari (80m. away), Drios and Golden Beach (500m. away)- easily accessed on foot, via a nearby seaside footpath. Golden Beach is famous for wind surf, scuba diving/snorkeling and other water sports and sea activities. The rather undeveloped Drios area, offers a multitude of old walking trails – making it ideal for trekking holidays. Would you like to talk in person? Fill up this call-back form with your name, tel. number and preferred times and we will get back to you!